The 2018 GMC Canyon Crew Cab is shown in Denali trim. If you test drive a pickup truck, please take it to a crowded parking lot — unless you never plan to drive it anywhere but cow pastures and creek beds. Parking some of today's full-size pickups in a crowded parking lot is like trying to slide a river barge into a backyard swimming pool; which is to say, it's almost impossible. 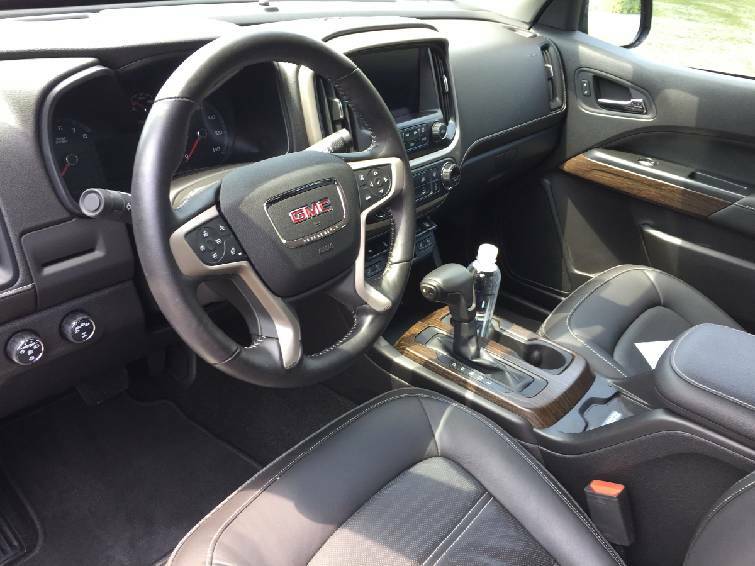 The 2018 GMC Canyon Denali has an upscale interior. Last week, we happened to be test driving two pickups, a full-size monster that felt as big as an Abrams tank; and today's tester, the mid-sized GMC Canyon, which was infinitely more manageable in tight quarters. In everyday Chattanooga driving, the Canyon was clearly the more practical vehicle. Plenty powerful to pull our steep grades, it was also no chore to park downtown. Moreover, it threaded Highway 127's construction bottlenecks with nary a scrape. The mid-size GMC Canyon is a fancier version of the Chevrolet Colorado pickup, and competes in the same class at the Toyota Tacoma. Our Denali-trim test truck was configured with a crew cab and a short bed, which makes it a good SUV alternative. A long-bed crew cab is available if you need more hauling capacity. Either way, it will pull about 7,000 pounds with a 3.6-liter, V-6 engine. Like all truck lines, the gulf between lowest-priced work version and the top-of-the-line, luxury-equipped model is vast. Our GMC Canyon Crew Denali tester, which includes such upgrades as heated leather seats, navigation, and extra helpings of chrome parts, lists for $45,935. Meanwhile, a stripped down Canyon SL starts at $22,095, less than half the price of the Denali. The quiet engine, ventilated and heated seats, compact steering wheel, sure handling, corner-step rear bumper and Bose stereo. No blind-spot monitoring system, pinched rear visibility and a wobbly ignition switch. We are a pick-up truck kind of town and this model should hold its value spectacularly well. Also, those Denali badges will impress the neighbors. The 306-horsepower engine makes for surprisingly quick launches. Cornering is secure and the suspension absorbs road imperfections. Visibility is generally good except for out the rear window, which is blocked somewhat by headrests and hardware associated with the sliding window. If your hauling needs are limited to kitchen appliances and an occasional load of mulch, the Canyon should be a find choice. Also, if you can't afford the Denali version, several less expensive trim levels are available. A diesel version is also out there, too, if you need more low-end torque.